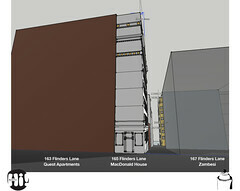 Voice your ideas for the lanes. 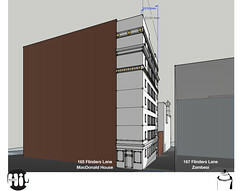 The now disused old MTC building – straddling Hosier Lane and Russel Street, just behind the Forum – is one of the few derelict building left in the Melbourne CBD. Strange really, considering its heritage, location and state of disrepair. Ever wondered why this is? I have, many, many times having lived next door for past 13 years. I get the sense that the Hosier Lane precinct is coloured by this anomaly – it’s definitely part of the charm, but it also presents a fairly desolate front to the community. 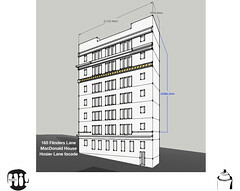 It is clearly unloved by it’s owners, possibly due to the burden of cost a renovation would require. Nonetheless, situated in a neighbourhood which dribbles to the tune of rotting waste bins, unrestrained recycling and general pedestrian discards, one might suggest this site offers an unrivalled opportunity. I imagine a site which has been stripped back to the bones, and I’m sure it’s bones still have what it takes to strip elegantly. With a frontage on both Hosier Lane and Flinders Street, the access and presence appear destined to flirt with the thousands of passing travellers, workers, businesses and homeless. Is this the next Meat Market, Jam Factory (I refer to the Adelaide Centre for Craft and Design rather than the Prahran concoction) or inner city Ceres? I do wonder – and sketch fantastical stories in my dream states. At times I imagine the space as a mix of recycling, free studio space for the creatively broke, a touch of free university and a smattering of pop-up – all under a tensile membrane protecting the existing theatrical spaces. No need for a big end of town response, more a community centre. The recent meeting of stakeholders of Hosier Lane at the Living Room was well attended. Its obvious that the shared theme coming through was the commitment from us all to make Hoseir Lane and even better place in future. My interest in maintaining an involvement is in the area of community development . Currently we’re a sort of disjointed mob made up of residents, businesses, cultural advocates and social outreach people. I think the sum of these can be much greater than the many individual parts if we seek ways of actually forming a sense of community. It’s encouraging that the seeds are there. I am keen though to emphasise that we have a more legitimate claim to community if we are proactive in reaching out beyond ourselves. Therefore I’d encourage everyone to see the presence of the Living Room in our midst as a great privilege and opportunity for us. I’m hoping we can look beyond the occasional disturbance factor and see if we can’t have an involvement with the place, and offer as much encouragement as we can for a facility which, by its presence in our lane, offers a great service and provides us with opportunities for outreach and community building. 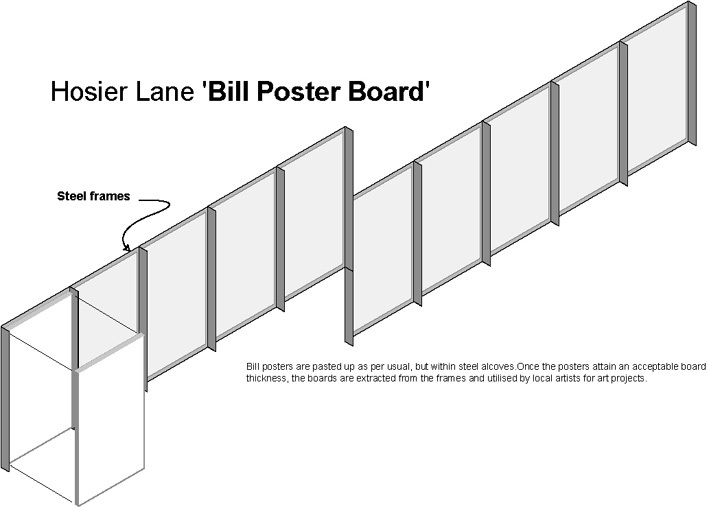 Welcome to Hosier Lane Bill Poster Board – art board built from bill poster felonies. I’d like to see “City Lights” re-invigorated….as much as the stencil and graffiti art needs to keep changing (even if it means the loss of a Banksy) to maintain artistic relevance, so the light boxes need to be either ditched or given a new lease on life. I’d like to see video art also installed in the lane – ACMI may be interested to sponsor projects like this. It would also be good to have some space made available for the many school groups who come here on excursion to be given the opportunity to follow up with some installations on a short term basis. Hosier and Rutledge Lanes should both be heritage listed by Heritage Victoria, not only for their street art, but for their historical significance. This was in the centre of the clothing (and of course hosiery) manufacturing trade in Melbourne. But it is also notable for a business retailing and wholesaling French cigarettes which claimed to cure ” asthma, catarrh, hayfever, oppression, neuralgia etc” These were Espic’s Cigarettes; they claimed SEVENTY YEARS of success! And there is much more. July 21, 2008 — The world’s organizations are changing. Networked tools are allowing groups to form and collaborate without any of the traditional friction that comes from managing the efforts of multitudes.